First an apology to my email followers. The email system broke down due to a technical issue, which is now fixed. So my most recent post a couple of weeks ago on our latest game of BBB didn’t go out on email. For the last two weeks we have been trying the Altar of Freedom American Civil War rules. This started from a suggestion made as a comment to this blog, as the rules combine a very interesting command and movement system with simple movement and combat mechanics. 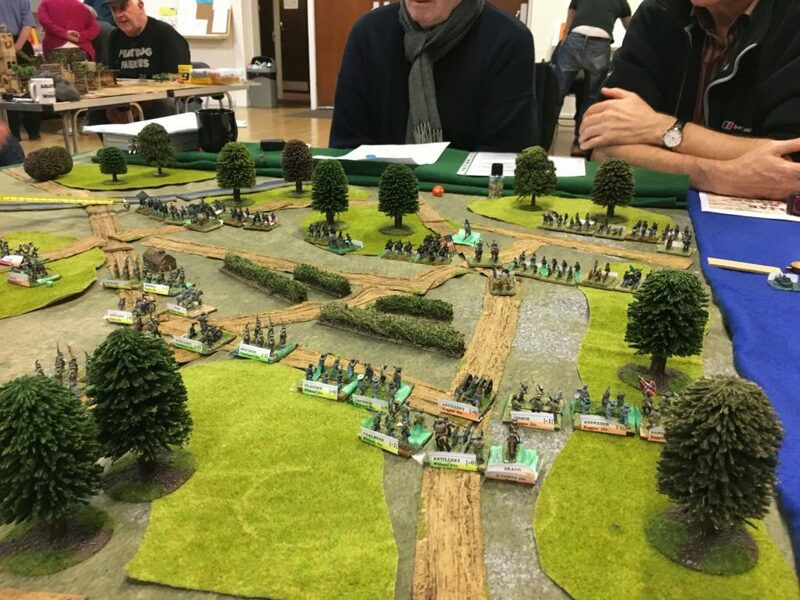 Last week we tried a scenario I devised based on the first day of Gettysburg. My fellow players liked the mechanics, by and large, but the game didn’t work that well. Partly that was to do with the way the game was set up. Our brigade units were made up of pairs of bases of 15mm figures that were put together on the night, using folded paper labels. These would not stand on the club’s sculpted hills. Also as an encounter battle there was a lot of manoeuvring and very little combat, as the Union side decided to pull off a withdrawal rather than try to defend the Seminary area. Given the this failure, this week we tried the Shiloh scenario from the rule book, described as “small” for 2-3 players (we had 5…). It is of a similar size, but this time there were no hills, and the units were pre-based and labelled. We still only got through about five moves, and only in the last was there a major combat. The Confederates found it slow going amid the forests, and the Union side once again pulled back to defend a more cohesive defensive position. The main point of interest in AoF is the command and bidding system. Each side gets a number of priority points (PPs) based on their leaders. These are allocated to divisions, to controlling the “turn clock” or to end of turn adjustments. Controlling the turn clock gives you the initiative and some control over how long the turn lasts. Each turn is effectively divided up into a number of moves depending on the number of PPs allocated to divisions. So, for example, all those with PPs of five would move first, then any with four, and so on. Their may be as few as two moves in a turn, or as many (theoretically, in the Shiloh scenario) as 12; more likely three or four. So if you allocate just one or two PPs to a division, it is quite likely that the turn ends before you reach it. This is all very interesting; players need to consider their bidding strategies very carefully – and there is also a lot of scope to vary different command structures for different armies. One of AoF’s design principles is to focus on these differences in command rather than different troop or weapon types. In the Shiloh game, the Union side is one combined army under Grant who has a single block of 20 PPs to allocate as the player chooses; the Confederates have 22 points but split between an army general and four corps commanders, each of which had further restrictions from leadership characteristics. That, and given the more passive Union stance in the earlier phases of the battle, meant that it was easy for the Union side to control the turn clock, and the Confederates soon gave up trying. The movement and combat systems are, on the other hand, very simple. That caused some grumbles amongst players who expected some rules to work in ways that they didn’t – in particular that firing and close combat were alternatives, when players expect a fire first and close combat later system (such as in the Fire and Fury/Bloody Big Battles system). But it is one of the things that makes the rules playable, once you are over how they work and stop arguing that such-and-such looks wrong. The verdict? Too early to tell. The command system is intriguing, but a bit gamey. Allocating your PPs and the various strategies needed to outwit your opponents in the bidding do not correspond closely to anything in actual warfare. It was quite slow going to build up forces for the attack. The combat did not play out to be quick and decisive, as billed. A lot of this is learning curve. Perhaps the Confederates needed to push forwards with a smaller number of divisions, and bring the rest up later once the path had been cleared. Because of the way the PPs were distributed between the corps commanders, it wasn’t so easy to refuse one flank and concentrate on the other. And the combat could be more decisive once we’ve worked out how to play to best advantage. Another problem is that the representation of the battlefield was not very accurate, as we had to set it up quickly using whatever terrain pieces the club had. Perhaps there were more ways through without having to plough through forest… though the forest was very much a feature of the historical battle. So far it looks as if we’ll appropriate the game as a club regular, once we’ve learned how to speed up, and represent the often rather complex terrain – based on actual battles. I’m less sure that I’ll be copying the mechanics for my Napoleonic venture. But the rules are a lesson in good game design.